It is 1883, and all of Klara Bozic’s girlish dreams have come crashing down as she arrives in Thirsty, a gritty steel town carved into the slopes above the Monongahela River just outside of Pittsburgh. She has made a heartbreaking discovery. Her new husband Drago is as abusive as the father she left behind in Croatia. Thirsty follows a chain of unlikely events that keep Klara’s spirit aloft: a flock of angelic butterflies descends on Thirsty; Klara gives birth to her first child in Old Man Rupert’s pumpkin patch; and BenJo gives her a talking bird. When Klara’s daughter marries a man even more brutal than Drago, Klara is forced to act. If she doesn’t finally break the cycle of violence in her family, her granddaughters will one day walk the same road, broken and bruised. As the threads that hold her family together fray and come undone, Klara has to decide if she has the courage to carve out a peaceful spot in the world for herself and her girls. Kristin Bair O Keeffe has an MFA in Creative Writing from Columbia College Chicago. Her work has appeared in a variety of publications, including the "Pittsburgh Post- Gazette," "Poets & Writers Magazine," the "Baltimore Review," and the "Gettysburg Review." She lives in Shanghai, China." 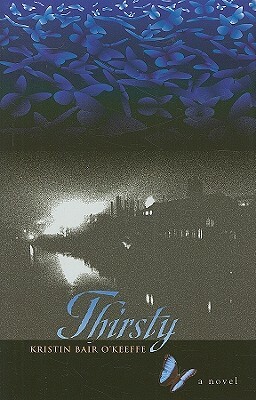 "Thirsty is a beautiful tale, vivid and gently told. It is the story of one woman’s incredible strength of spirit, and a reminder of the foundation contemporary America is built upon—one of unspeakable cruelty, and Job-like suffering, as well as generosity and unbreakable hope."